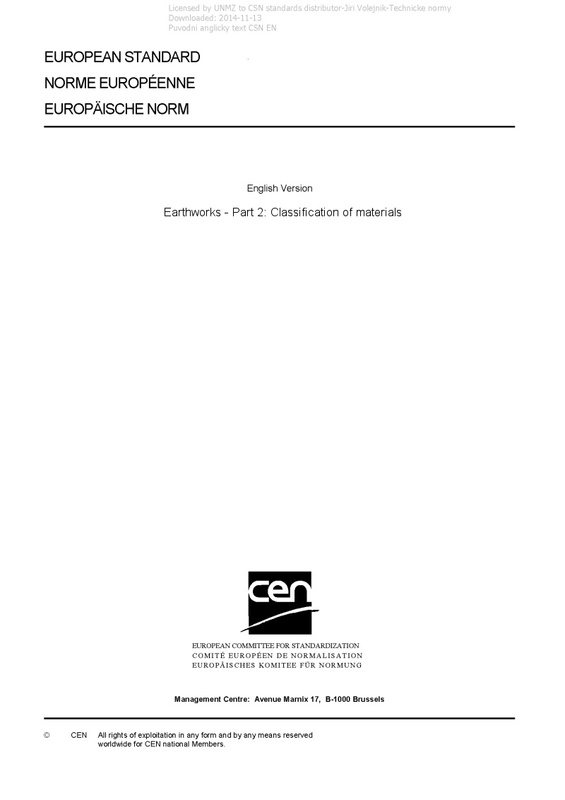 EN 16907-2 Earthworks - Part 2: Classification of materials - This document defines a common basis for description and classification for use by all parties involved in the design, planning and construction of the earthworks. This document specifies the processes and properties to be used in the description and classification of earthworks materials. It specifies soil and rock groups as a basis of material specifications for earth structure elements. This classification relates to the physical and chemical properties of the soil and rock materials. NOTE 1 The approach to description of soil and rock set out in EN ISO 14688-1 and EN ISO 14689 respectively and the approach to classification of soil set out in EN ISO 14688-2 are applicable to earthworks, but the range and scope of classification for earthworks given here is more detailed and orientated to the specific demands of earthwork procedures and earth structure elements. NOTE 2 Informative examples of existing national experience based classification systems and their use are presented in the annexes to EN 16907-1:2018.